One of the most difficult tickets in town for dinner. 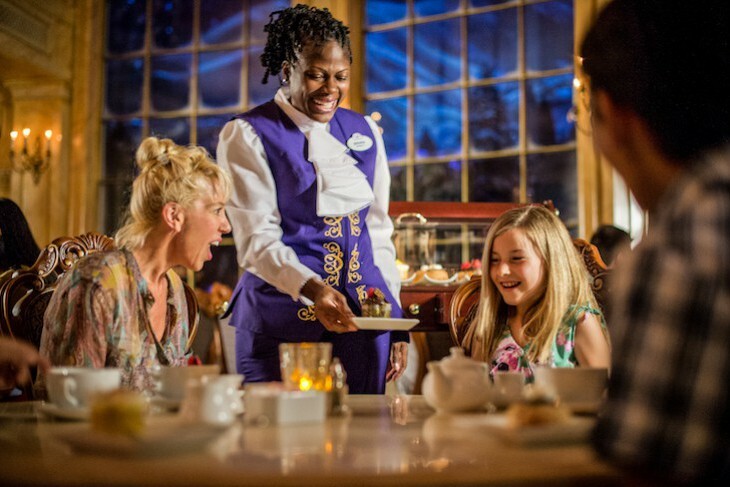 Enjoy a meal with Disney Princesses high above Fantasyland®. Italian food on Main Street U.S.A®. French-inspired cuisine. Quick-service breakfast and lunch; table-service dinner. A pair of minotaurs are your greeters as you cross a stone bridge and into the Beast’s castle and this fantasy of a restaurant. While lunch is a quick-service option, dinner here is a festive table-service event with, believe it or not, French and California wine along with Belgium beer. 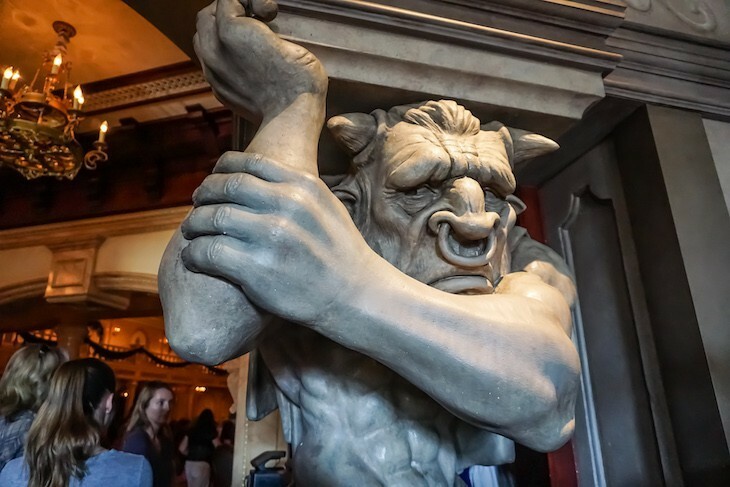 Inside the Beast’s castle has been recreated from the terrazzo floors to the massive chandeliers and cherubs frolicking on a frescoed, domed ceiling, even suits of armor lining the hallways with royal purple and gold décor. At dinner you may dine in one of two dining rooms: the Ballroom where music from Beauty and the Beast plays and your view outside the tall, arched windows is one of a softly falling snow in a moonlit sky; or a darker, more sinister West Wing dining area where intermittent thunder and lightning set the scene as a portrait hanging over the fireplace changes from the prince to the beast as an enchanted rose slowly loses its petals. Sorry…I almost forgot about the food which is actually quite good, particularly when the Magic Kingdom and great food is rarely used in the same sentence. 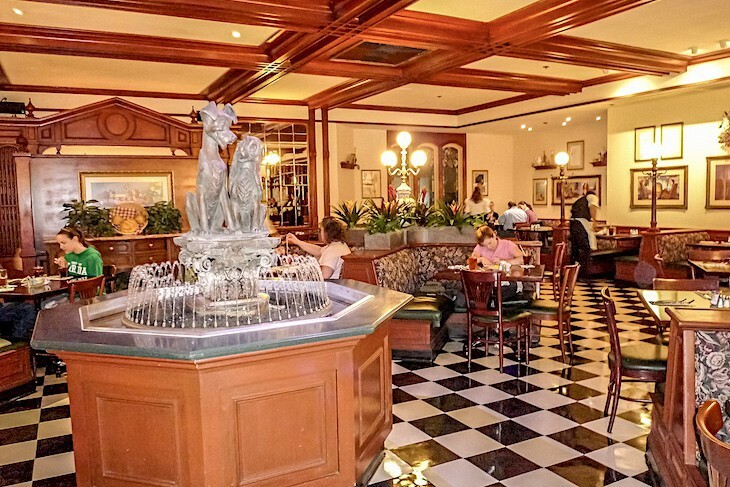 Dinner is a prix fixe meal with starters such as French onion soup, nice and bubbly with crusty cheese and a simpler broth than most…ooh la la! A roasted pork tenderloin with caramelized onions sometimes arrives a bit overcooked, so you may want to go with the seafood bouillabaisse or spice-dusted lamb chops. 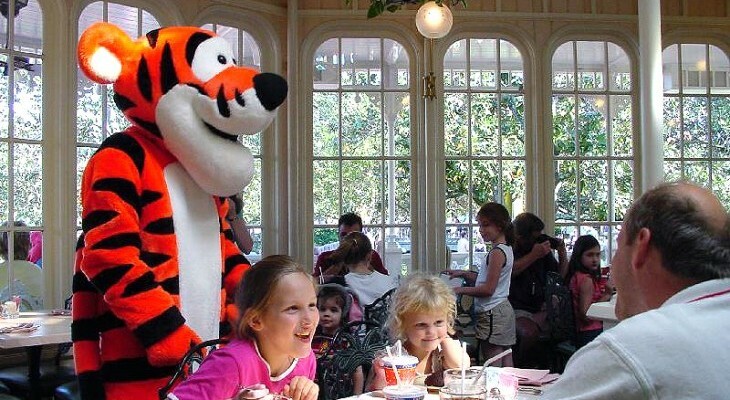 Cara's Tip: At least for now, this is the most difficult ticket in town for dinner; it is essential to call (407) WDW-DINE, or (407) 939-3463, at 7:00 a.m. Eastern Time Zone exactly 180 days prior, and even then be prepared to find nothing available except for maybe on one of the last days of your vacation. Contemporary American cuisine. Breakfast, lunch, and dinner. 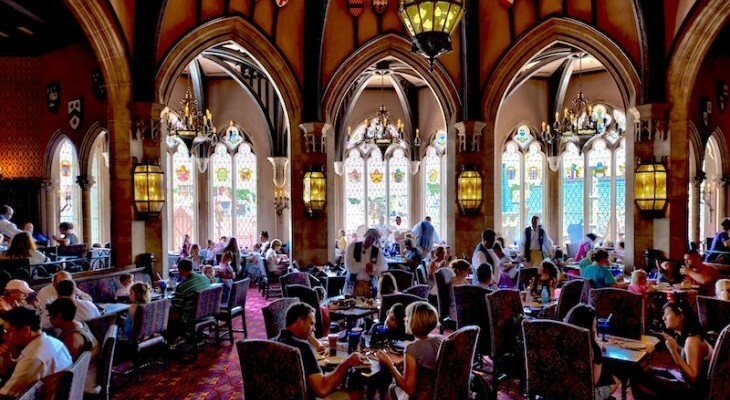 Those who want to feel like a six-year-old again should definitely plan to dine in Cinderella’s fairy-tale castle, a medieval dream with thick stone floors, shining shields, dazzling suits of armor, and resplendent banners. Up a spiral staircase is the grand dining room where through glittering leaded-glass windows is a bird’s-eye view of Fantasyland and, if you time it correctly, Wishes fireworks. It’s a great respite from the throngs below with satisfying food and where everyone is a prince or princess waited on by “royal attendants” clad in Renaissance clothing. All meals are hosted by Cinderella who you’ll take your photo with on arrival downstairs, while upstairs is one of Disney’s best princess meal with such characters as Ariel, Snow White, Jasmine, Belle, and Aurora. Each little princess receives a sparkling wand, each prince a knight’s sword, and all leave with a nice photo package of your visit with Cinderella. Cara's Tip: While it’s an uber-popular place to dine, it’s only worth the high price tag if little ones, particularly little princesses, are part of your vacation party. To ensure a seat for these highly coveted meals it’s essential to reserve exactly 180 days prior. Food arrives very quickly so if possible drag out each course so you’ll be able to see each and every princess before the end of the meal. Full payment is taken at time of booking (unless you are on the dining plan in which case it will be a credit card guarantee) with a one-day cancellation policy. Character buffet with Winnie the Pooh and Friends. Breakfast, lunch, and dinner. Tropical cuisine. Lunch and dinner. American cuisine. Lunch and dinner. American cuisine. Breakfast, lunch, and dinner. Italian cuisine. Lunch and dinner.